The Barangay Ginebra San Miguel is scheduled for a head-to-head Championship game against the Meralco Bolts at 6:30 P.M. on October 22, 2017 live from the Philippine Arena, Bulacan. After got down at 0-2 in the 2017 PBA Governors’ Cup Finals, the Bolts have even the series at 2-2 and it converted the championship showdown to Best-of-Three. Compared to Game 3 where coach Norman Black’s late fourth quarter timeout became somehow an issue to coach Time Cone, in Game 4 both coaches still have two full timeouts left but opted not to use it and let their players continue to play ball. 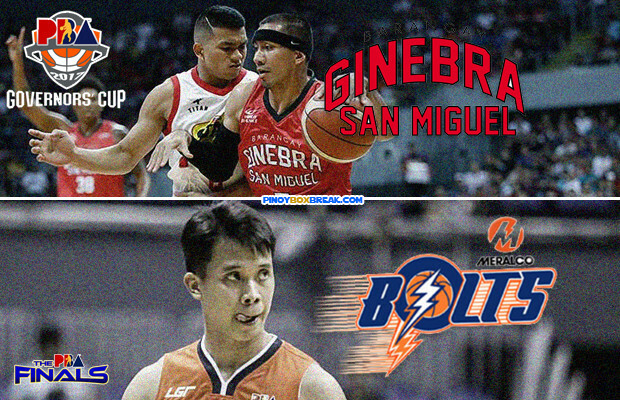 That decision gave good results to Meralco Bolts but it was the opposite for the Barangay Ginebra. “I think we’re in the heat of the moment. We see we had the opportunity where we could score. Of course, we’ve wanted to get a timeout and drop a designed play for that type of situation, but I think we got a couple of good looks. We just didn’t convert,” said Justin Brownlee. “I thought we had some good looks, we just didn’t knock them down,” Brownlee said after finishing with 34 points, 14 rebounds and seven assists in Game 4. Broownlee had a couple of chances to tie the game but all of his shots rimmed out. That Ginebra oppurtunity to even the score was made possible by Sol Mercado who chased the layup attempt of Jared Dillinger. To add to the woes of unsuccessful comeback of Gin Kings, Sol Mercado injured his ankle after his Dillinger’s chase-down block. Reynel Hugntan continue his hot shooting from behind the three-point line and contributed 14 points. Hugnatan provides more space to Allen Durham inside the post as he and other Bolts shooter forced Ginebra to stretch their defense. After shooting a miserable 10% from the field, Chris Newsome appeared like a new man in the Game 4 and delivered 18 points. He was also named as the Bida Player of the Game after the match. Most Improved Player runner-up, Amer Baser added 11 points who sank a momentum changer three-pointer less than two minutes in the fourth quarter. Baser’s shot puts Meralco ahead by two points, 83-81.